Batavia or United Dutch States. 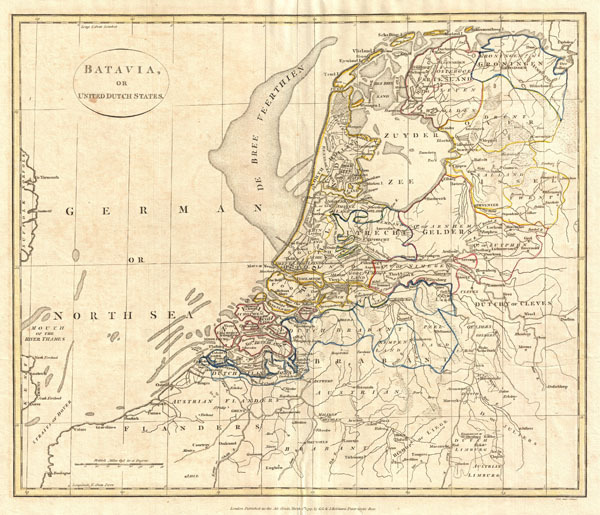 A fine 1799 map of Batavia or the United Dutch States (the Netherlands) by the English map publisher Clement Cruttwell. Map is highly detailed, with counties and municipalities outlined. Of note on this particular map are the canals and dikes Cruttwell labeled. These are extremely important to the country, as two thirds of the land is vulnerable to flooding. River dikes prevent flooding from water flowing into the country by the major rivers Rhine and Meuse, while a system of drainage ditches, canals and pumping stations (windmills) keep the low lying parts dry for habitation and agriculture. The Beemster, as Cruttwell notes in Northern Holland, was the first of these and was reclaimed from a lake, the water having been extracted by windmills. He also labels what is known as the De Breeveertien (De Bree Veerthien) a large offshore shoal in the North Sea now home to an important wind farm. In North Holland he identifies Zuyder Zee, which at this point in time was a shallow bay in the North Sea. In the 20th century the majority of the Zuyder Zee was closed off and the salt water inlet changed into a fresh water lake called the Ijsselmeer (IJssel-lake), named thus after the river that drains into it. The whole offers hand color and fine copper plate engraving in the minimalist English style prevalent in the late 18th and early 19th centuries. Drawn by G. G. and J. Robinson of Paternoster Row, London, for Clement Cruttwell's 1799 Atlas to Cruttwell's Gazetteer.